MDC Settings can be accessed from the Settings tab in Mobile Data Collection app. Info – short Get started tutorial. Projects and Maps & Layers – choose between Projects created in the Mobile Data Collection Portal or Maps & Layers created in Map Editor. Please note that only database point layers can be selected from the Layers drop down list. Refresh Projects – refresh a list of projects or the maps. Note that auto-sync feature will refresh the project and the map after a few minutes if the Internet connection is available. This feature prevents data loss. Project/map name – choose the project or map from the drop down list where data will be collected. Refresh Form – refresh the form after the changes are made. Note that auto-sync feature will refresh a project and map after a few minutes if the Internet connection is available. This feature prevents data loss. Offline maps – makes a map available when there is no Internet connection in the area. Click here for more info. Zoom after send – when the new data is collected, this feature automatically zooms to the current mobile device’s location if the option is turned on. Follow user on map – if the option is switched on, pin on the map will adjust depending on the current map position. Auto sync – when the option is turned on, the system notify you if there are any changes made on the current form. This feature prevents data loss. If the data is sent in an outdated form, the system will ask the data collector to update collected data and prevent data loss. Send using cellular data network – when enabled data will be sent using cellular data network. If disabled, your device will send the data you collect only via Wi-Fi connection and in that way prevent the app from using your mobile internet traffic. Photo quality – choose between the high and low setting for quality of photos taken with MDC. The low setting gives 800x800px images. The high uses full resolution of your device’s camera. Log out – log off from Mobile Data collection application. Form – retun to the form and collect data. 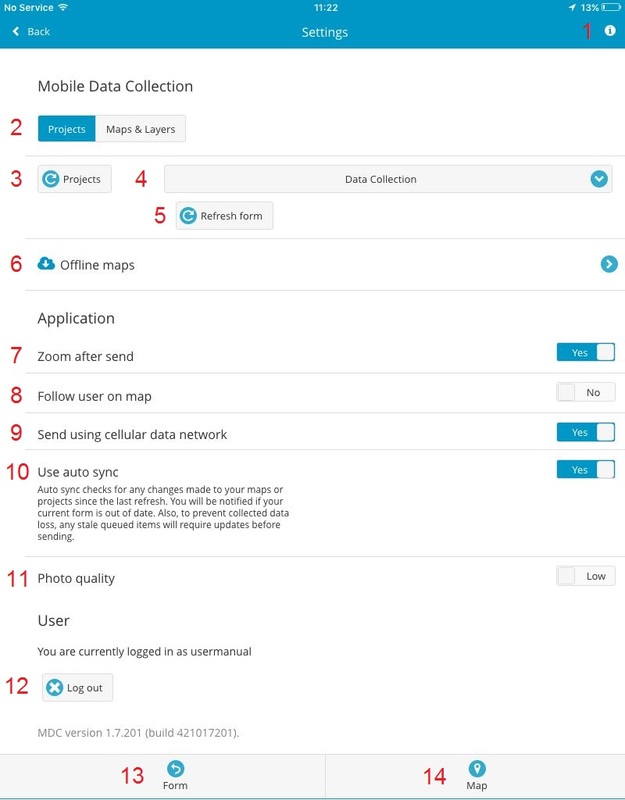 Map – review and edit the collected data.